This chapter is a translator nightmare, though…… What with choosing a correct term to maintain the ‘otherness’ of the story. Whether it was in the Kingdom’s Capital 『Parnam』 or the Dukedom’s Capital 『Van』, the King’s job never changes. Scanning the documents that Hakuya had brought to the government affairs room and then signing them over. After we had occupied Van, the workload that needeed to be done had also increased. The amount of paperwork that had been amassed for several days due to the music program plan was painful to see. Even after working from sunrise to sunset and fully utilizing 『Living Poltergeist』, the accumulated stacks of documents by no means decreased. In the end, even in Van, I slept on a bed placed in the corner of the room, so I could immediately go to work after waking up. Liscia, who was helping in the paperwork besides me, spoke out in amazement at how I got to work as soon as I woke up, day after day, constantly staring at the documents that were piled up on the desk underneath the morning rays that slipped through into the room. Liscia looked at me coldly. Yeah, in order to make this gag come true, first I must make the phrase『Amidonian Renaissance』 become an established name. Well, the original Renaissance was an act to escape from the influence of Christianity and to revive the culture based on the humanism of Ancient Greece and Rome, but perhaps in Amidonia’s case, the cultural revival was more about freeing themselves from the military-first doctrine and glorifying the arts and culture. To be honest, I really want them to spare me from their incessant desire to hold events related to the arts. This place was, more or less, an occupied town, after all. There is a possibility that an event where a lot of people are gathered could be used to brew a conspiracy or become a target of a terror act, that’s why there was a need to check each and every single event. Well, this was also something that I wanted. Even if there is just a short sentence written in a book that is negative towards the government, it would be a target for book burning. Just by singing a song that advocated peace, someone could be imprisoned. If there was a play that was a satire of the government, the troupe leader would be publicly executed…… Amidonia’s government is capable of doing anything without hesitation. That’s why the people’s excited attitude towards art was a backlash against the previous regime’s acts. In the end, no matter what I do, my work won’t decrease. Just like that, I continued working until the afternoon without any changes. When my stomach became empty and I told Liscia about taking a break for a meal, Poncho Ishidzuka, the Minister that was responsible for matters relating to food, entered the room. Poncho’s perfectly round stomach shook when he stood before me and he made a bow with a nervous expression. After saying this, Poncho took out something from his bag and then placed it on the desk. Liscia, who saw it from my side, tilted her head. Yes, what Poncho had taken out was a flower stem. That flower had an appearance similar to a lily. However, the petal’s color, was colored in a marbled colors of pink, yellow and light brown, giving off a poisonous shade. If this was a mushroom, then it would be something that mustn’t be eaten. Although, there was an American candy colored like this (prejudice). Wasn’t this something that you could consider to be an illegal substance? Well, if it wasn’t a high efficiency filter mask, then it would be hard to completely remove the pollen. Well I don’t have it, but someone with hay fever would have a hard time if it’s only with a normal mask. When he said this, Poncho took out something that rolled on the table. This is…… a vegetable? 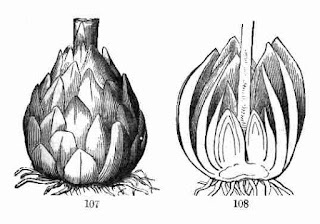 It appearance was white, round, rugged, and had numerous cloves like a leek or garlic that was crowded like a pinecone. When I suddenly yelled, Liscia became surprised. I had unconsciously become excited at the sudden appearance of a high class ingredient. Eh? This is lily root? I have seen a fragment of them used for the chawanmushi, but this is the first time I’ve seen it in its bulbous state. Certainly, it had the same taste like that of a potato. This is good. Lily roots certainly contain carbohydrates. 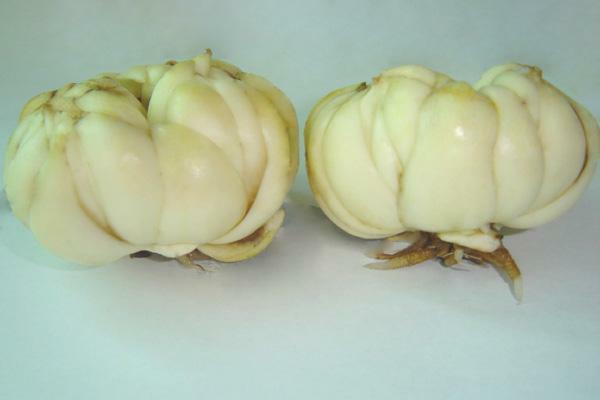 It can be used as a staple food just like potato. If we could harvest this, then wouldn’t it become a breakthrough to settle the food shortage in Amidonia? Even if it’s edible, if it can’t be harvested, then there is no point in…… eh? Wait a minute? Then how could there be a bulb right here? Poncho immediately took out a map and pointed at the northeastern region of the Grand Chaos Empire. Pongos…… In other words, apes? Poncho nodded. I see, it was similar to the cormorants used in cormorant fishing. It seems to be difficult to tame and train them…… but our country have someone who is an expert in this field. But she resolutely turned her face away as if to say, don’t demand an opinion for this from me. By the way, one week (8 days) later, among the food rations that were distributed to Van, was a dumpling that was made from Bewitching Susannas’ bulbs (popular name: 『Susanna’s root』). This dumpling, that can either be boiled or fried, became renowned as delicious, and took a role in pacifying the hearts of the occupied people. And then, in Van’s food culture using Susanna’s root, Poncho, who had been helping to distribute this dumpling, was respected by the housewives that lived in Van, as if he was some kind of deity. They called him 『Ishidzuka-sama』. Perhaps one day he would be deified, just like Biliken-san in Japan. Next chapter: Souma’s date with a loli and a beauty! A black company (ブラック企業 Burakku kigyou), also referred to in English as a black corporation or black business, is a Japanese term for an exploitative sweatshop-type employment system. While the term "sweatshop" is associated with manufacturing, and the garment trade in particular, in Japan, black companies are not necessarily associated with the clothing industry, but more often with office work. Souma is mimicking Hige Danshaku (a manzai duo), their gag catchphrase is ルネッサン~~ス, as you can see they prolonged the word ending. Please Souma, stop making obscure references that is hard for non-Japanese to understand. I think Souma means “marbled candy”. In the raw, Souma comment thatリリー (Ririi) is actually 百合 (Yuri), the Japanese words for lily. Since I can’t find any ancient English words nor synonyms for Lily, I change the sentence so it would make sense in English. Bewitching Susanna came from shoshan, the Hebrew word for Lily. I can use Greek: Keiron or Leiron, too. (E/N: Maybe Susanna. Ancient Egypt is older than Ancient Greece. Plus Bewitching Susanna feels like a reference to the poisonous Belladonna, which has a harmless Lily version, too.) Just like that, for the rest of the story リリー will be translated as Susanna (Other world’s Lily) while百合will be translated as Lily (Earth’s Lily). Fun fact, some lilies do have hallucinogenic effects. I don’t recommend you to use them, though, as they are also poisonous. I don’t want to have guilt if some of my readers died while trying to get high… (E/N: Pfft, westerners don’t need lily roots to get high. That’s what bath salts are for.) Ah, yeah I remember a doctor’s joke about USA: It is easier to obtain methamphetamine to synthesize pseudoephedrine, than buying pseudoephedrine in the pharmacy. The irony. Use HEPA Mask for heavy anti-pollen duty! For people with low money, use a NIOSH N95 dust mask! (E/N: Low budget fast way of doing it is to dumping water & a beaten egg into a bowl & microwaving it. I usually use chopsticks to beat the egg.) My egg custard version is just egg, water, strained with maize flour, with cabbage, beans, and beansprout, put into a bowl and placed in the middle of boiling pot. Cormorant fishing: Using a bird (cormorant) that will catch fish in the water. The small fish will be eaten by the cormorant while the larger fish wouldn’t be able to pass its throat as its throat where tied using a rope or leather cord. See this Acashic Record. I’m sorry I don’t know what Souma refer to in this sentence. Perhaps he refer to Nikkou Monkey Troupe(日光猿軍団)? But what is Neva? Nevada? NERV? In actual Japanese, the term is Yuri-Ne百合根, but this sentence use Ririi-Ne リリー根. Yuri-Ne is Lily’s Root. While Ririi-ne is Susanna’s Root. To put in simply: A doll made in America, ended up being enshrined because of the doll’s relationship to good fortune. -I wonder what happnened with Roroa... I thought she was going to do something to that music broadcast. Well... Do you know that hemp is the same species as marijuana (both is cannabis sativa)? And hemp is grown since ancient times for food and fiber? But selective breeding brought the level of THC (the main active substance) in hemp to low level. Do you know that because many people thought hemp is the same as marijuana cause hemp agriculture highly unpopular although hemp is actually a plant with high output? I believe what's wrong is not in the drug, but the users. I mean, as a doctor I got opioid analog, meths analog, and many kinds of 'fun drugs' everyday, but I don't abuse them nor have any inclination to use them. After all, I know first hand what they do to my brain and liver. What I mean: Just like hemp. One day, through selective breeding, the Bewitching Susanna might get trait where they have reduced hallucinogen concentration, or have lesser pollen output. So just because a plant is dangerous, doesn't mean that human won't find out about their use. Even the deadly Manchineel tree have it use for humans. This is Japanese whose food also has a dish of raw poisonous fish. It's business as usual. Also potato can be poisonous if you dont know how to store and process it. @Canaria They should make cursed sword and use it as a fence like some op mc is doing. Welp, Poncho saves the day, I guess. That was a fun read. Poncho is always fun to read about. His interaction with Juna in the Food Show was really fun. Especially his reactions to Juna's teasing. Today too when he replied to "Paramedic" was humorous. I love this series. Thanks for the chapter. Yukkuri-san, thanks for hard work. Your footnotes are really the best, so many cultural references everywhere. Oh~ Loli and beauty...this looks promising? The next one should be tomorrow (08/28), according to the TOC. PS: is there a way to read the unedited version? (for those who can't wait). I'll try to get on top of things more. this chapter contain too much reference and technical words..
Hmm.... Maybe it's just me but that Susanna name gave me shiver. I mean, as an Indonesian, there's no way i don't know about Susanna. Actually, I recalled the usage of hemp materials is very common in Asia such as hemp rope, bags and clothing, etc. Thanks for the chapter. Thank you very much for the chapter. keep up the good work.